The fastest way to get yourself admitted to a highly competitive college or graduate school is an impressive and powerful letter of recommendation. A great letter of reference distinguishes you from the pack. The question is how do you differentiate between the okay recommendation letters and the excellent ones? Just because your recommender is a distinguished professor or a respected employer doesn’t mean they know how to write a great letter of reference. Your recommender might not have the time to write a great letter of reference for you. They may describe you as “a polite and friendly student,” but how does that help you with your application? In most cases, letters of recommendation are written in bogus, generic language that doesn’t show your competitive advantages. 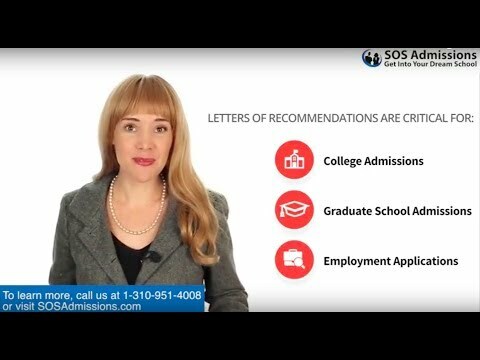 At SOS Admissions, we use a compelling letter of reference writing style that focuses on your positive traits and accomplishments. Our reference letter writing service has helped many applicants secure admission into highly competitive colleges and graduate schools. Letters of recommendation are our “secret weapon” for helping our clients get into competitive colleges and universities. We put every necessary resource to ensure you get your perfect letter of recommendation (letter of reference) within three business days. We will discuss what you want from the letter of recommendation and then contact your reference to help them write the perfect letter of reference for you. Some references may be happy to allow us to write a recommendation letter on their behalf. If your reference prefers this option, we will conduct an interview for you, allowing us to create the reference letter you need. Your reference will be given the opportunity to review the letter of recommendation before they submit it. If they have any reservations, they can request modifications to the letter of reference before signing it. The Letters of Reference are to be read, approved, and submitted by your selected recommender. We will make the letter of recommendation 100% truthful, reflecting your true academic or work experience. Our letter of recommendation writing service is designed to make the best out of every client’s application. Writing Style: Our expert writers make it their duty to ensure that every letter of recommendation or letter of reference is an original masterpiece designed to maximize your chances of admission. Professional Knowledge: We know what admission officers are searching for, and that is exactly what we include in our letters of recommendation or letters of reference. Personalization: We do not use generic templates. We write every letter of recommendation or letter of reference from scratch, making use of the information you provide to personalize the letter. Our reputation in the admissions field is unmatched by any other company, which is why SOS Admissions can boast thousands of happy clients and counting. Our professional team members have helped many applicants secure admission to top colleges and graduate schools. We at SOS Admissions consider your success our success, so we make use of every resource available to us to ensure your application is successful. Consultation can be done from anywhere in the world via Skype, Google Chat, or FaceTime, or you can walk into our Beverly Hills office.